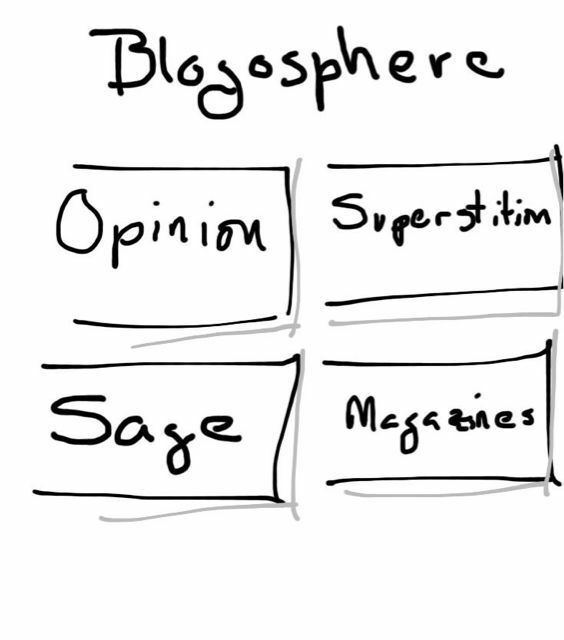 I have been looking at how to apply Marshall McLuhan’s Laws of Media to the Web for my next post on cloud computing. For a “hard” scientist, McLuhan is as close as we will get to Newton in Sociology for understanding how technology effects society. His Laws of Media are as rigorous as Newton’s and his equation – “the medium is the message” – as famous as Einstein’s “E equals m c squared” if not as equally obtuse. One can be easily lulled into believing it is simple and straight forward. Though McLuhan’s presentation may seem flippant, the sociology in the background is serious and complex. Indeed it is the background or context of technology that at first seems unmoved and unchanging that does eventually change in ways that might be missed because the changes appear unrelated. But it is in understanding both the obvious implications of a technology and the not so obvious effects on culture and society that transforms technology into media in McLuhan’s view. For example, an obvious and much anticipated characteristic of the internet is that it “makes the world much smaller”. One might expect in the free exchange of ideas and knowledge that the world as whole would become more unified. But as we look at society, it is anything but unified. Can the Internet as a medium be responsible for this? As I look at the problem from the 4 Laws of Media, the results are startling and not what I initially expected. 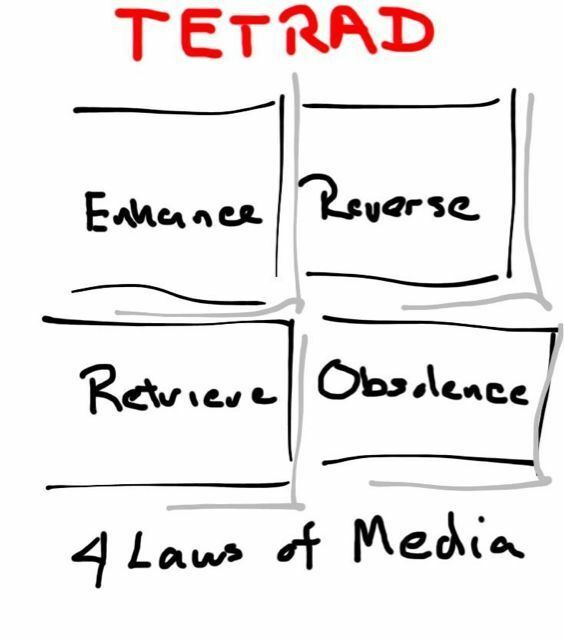 To review briefly: the four laws represent four aspects of media that must always be present. To apply, one must not only consider what is manifest and technical but also latent and behavioral in the background. Enhance The technology must enhance some capability of the person. The medium is an extension of the person. Retrieve The result is a retrieval of some earlier service or capability that was lost and is now brought back into play in a new form. Obsolesced What is pushed aside and made obsolescent. Reverse If the new media is taken to extreme what will result that reverses the original characteristics of the media when it was first introduced. So now apply these rules to a medium such as the Internet (before the Web). The Internet (as invented by DARPA and Al Gore) enhances thought both in retrieving information that nurtures thought and expressing thoughts to help others. It obsolesced books or publications that inform thought but at a much slower rate and at higher cost preventing just anyone off the street from participating (except as a reader). 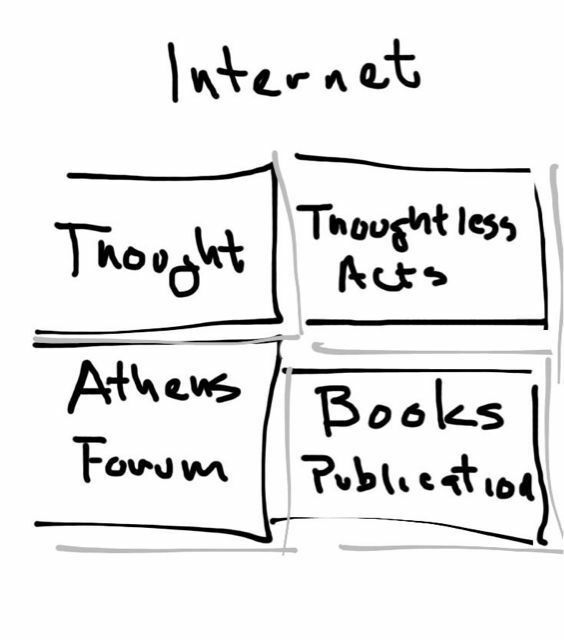 The Internet retrieves the Forum in Athens where individuals came to share thoughts and dialogue. Normally one would think of the Internet as a medium of communication with dialog as a form of communication. Cell telephones are a form of communication medium that enhances the voice, the Internet goes beyond voice and records & recalls what has been “voiced”. It is therefore an extension of the minds creative abilities to recall, extend and amplify thought. This is important when considering the original characteristics and intentions and how the medium when taken to extremes reverses these characteristics. The expectation was that the Internet would bring democracy or equality to thought allowing persons anywhere in the world to participate in the public forum. The hope was for unity of thought that transcended specific cultures or traditions – world-wide culturalization. A scientist in Botswana would be on equal footing to one at MIT or Oxford. The expected unity has not materialized. That is because the reverse of thought is thoughtlessness or those things that imprison the mind. Instead of amplifying just good and reasonable thoughts, the Internet allows marginal thoughts that would be normally isolated and pushed to the “fringe” of society to likewise find and bring together the few supporters to amplify dogma, bigotry, lies, superstition, and racism just as quickly. In a world of false equivalency, it seems only fair that every thought whether based on truth or lies to be treated equally. Instead of unity, we have a fragmented American as well as World culture where individuals can believe and operate in their own “realities” with their own “truths” and find others that believe the same. So the fact that in this country no “reality” can get more than 20% to 30% confirmation in polling, is this because of the Internet? Your thoughts please. To check this further, I have applied the Tetrads to Facebook, Twitter, and the Blogosphere. Amazingly they are very different media though they seem to be doing similar things communication wise. What are your views? Not to belabor the obvious, yes this is important for anyone attempting to measure “behavior” on the Internet because we are attempting grasp the effect (sociology) of technology on behavior. So get out your crayons & paper and start drawn up some Tetrads! This entry was posted in Asides and tagged Blogosphere, Facebook, Internet, Marshall McLuhan, measurement, Media, online / offline behavior, Social Media, Twitter, VoC. Bookmark the permalink. Interesting piece. Tetrads are a lovely brain-strorming idea to begin thinking about the effects of media. 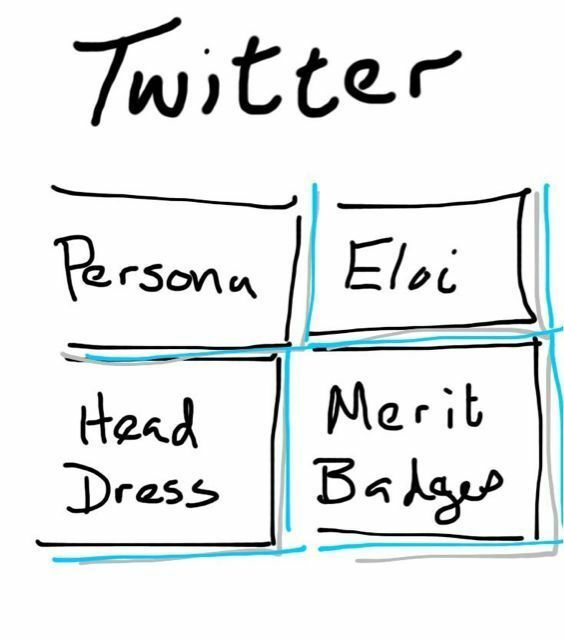 What do you mean by “Eloi”, by the way? As in the Time Machine? I think you could push some of these things further, too. Nice post. The value I see in Tetrad is to bring different concepts (4 Laws) together into a Gestalt. I suppose one can over think these, but don’t believe that there is only one answer. Each brings their own insights and thoughts into the process. I did not write up (push) the other Tetrad’s because I wanted to encourage comment and discussion. To me the surprising discovery was that Facebook and Twitter are very different media though they are based upon the same over all platform, the Internet. With Twitter one is creating a persona, an image of themselves for presentation to the world by the news and insights one wants to present and the articles and concepts they chose to share. The Eloi from the Time Machine were devoid of personality or persona. The fact that Justin Bieber takes up 14% of Twitter bandwidth or Britney Spears and Madonna in Search and Video before him is maybe an indication of this. 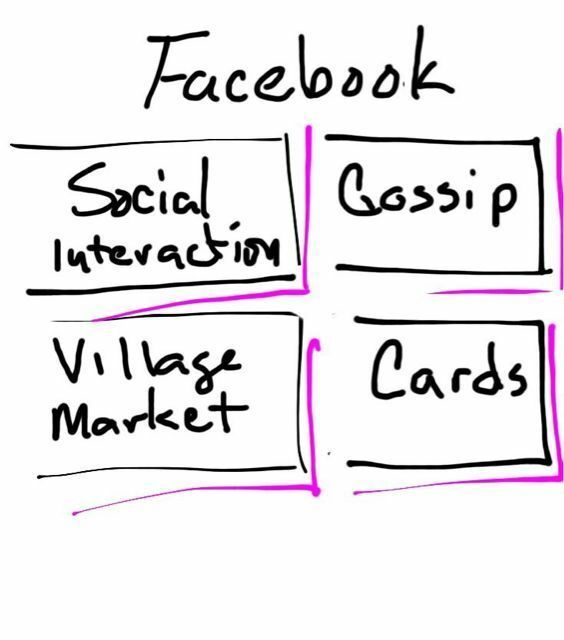 However I can see other aspects to Facebook and Twitter that could be developed in the Tetrad. For example forming and applying networks that could be explored providing a very different view. Perhaps more thought should be brought to this. Thanks again for your comment. I encourage you and everyone to continue the discussion.